I’m a Trader Joe’s sucker. I go in with a list. I really do. And end up with about twice as much as what I intended to. Kind of like Target, but strictly food items. I’m sure many of you have seen this list of “must haves” from there. But even the everyday stuff that you can get pretty much anywhere catches my eye. They had a great deal last week on zucchini that I couldn’t resist…all I had to do was decide how to prepare it. Heat oil in a dutch oven (2 inch depth) until it reaches 350 degrees (or throw a few breadcrumbs in…if they sizzle, it’s ready!). In a shallow bowl, mix cheese and panko with a little salt and pepper. In a bowl, whisk eggs until beaten. Dip zucchini, one or two at a time, in egg first, making sure to let all excess drip off before transferring to panko mixture. Pat into panko and cover completely, then transfer to baking sheet. Working in batches, fry zucchini until golden brown. Transfer to a paper towel lined plate to drain. Sprinkle with a little bit of cheese before serving. Stir all ingredients together. Keep in fridge until serving. 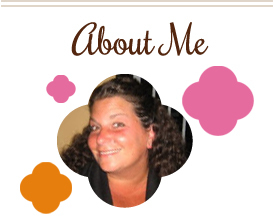 This entry was posted in appetizers, condiments, dip, sauce, side dishes, zucchini. Bookmark the permalink. Yumm, these look great. One of my favourite dishes from my hometown is zucchini sticks – so this totally reminded me of home and I will need to make them now with the two zucchinis in my fridge! Great idea! I always end up buying cookie butter when I’m there…and it’s always disastrous! 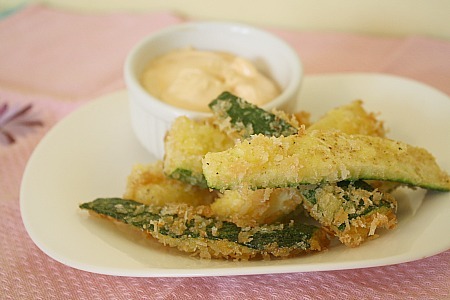 Zucchini is a good buy though because these sticks with the AMAZING mayo…fantastic side.